The Kaplan Humanities Institute is proud to recognize and financially support working artists across the visual, performing, and literary arts. See below for more details about the program. Zielke and Goldstein's residency is co-sponsored by the Department of Radio/Television/Film's MFA in Documentary Media and the Kaplan Humanities Institute. Zielke and Goldstein are currently developing a new sci-fi documentary, tentatively titled “A Machine to Live In,” linking the cosmic power structures of the state to the mystical architecture of cults and utopian cities in the distant hinterlands of Brazil. This hybrid film provides a complex portrait of life, poetry, and myth set against the backdrop of the space-age city of Brasília and a flourishing landscape of UFO cults and transcendental spaces. Zielke and Goldstein will show selections from their work-in-progress and propose a utopian methodology for speculative / polyphonic documentaries. Talk will be followed by Q&A conversation and light refreshments! 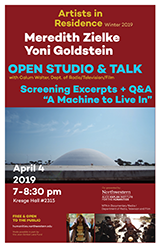 Screening of excerpts from "A Machine to Live In"
Deborah's residency is co-sponsored by the Department of History, the Department of English, The Nicholas D. Chabraja Center for Historical Studies, the Alumnae of Northwestern University, and the Kaplan Humanities Institute. 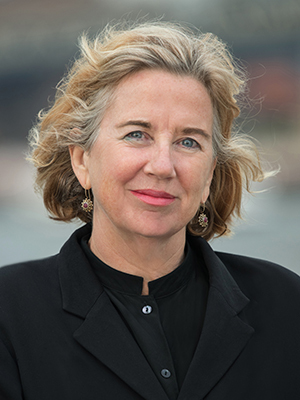 Deborah Baker is the author of In Extremis: The Life of Laura Riding, which was shortlisted for the 1994 Pulitzer prize in Biography (Hamish Hamilton, Grove Press). In 2008 she published, A Blue Hand: The Beats in India (Penguin Press, Penguin India). The Convert: A Tale of Exile and Extremism (Graywolf, Penguin India) was a finalist for the National Book Award in Non-fiction and has been translated into Arabic, Indonesian, and Malayalam. Her most recent book, The Last Englishmen: Love, War, and the End of Empire, was published in August (Graywolf, Chatto & Windus, Penguin Random House India). She lives in New York and India. In conversation with Deborah Cohen (Peter B. Ritzma Professor of Humanities and Professor of History), Deborah Baker will discuss how she found the stories on which her books have been based and her thoughts on making archives—and people—come alive on the page. Deborah Baker photo ©Julienne Schaer. The Kaplan Institute's Artist in Residence Program brings internationally acclaimed artists to campus for quarter-long residencies. The program seeks to facilitate production of new work and to provide insight into the process of conceptualizing and producing creative work. Since 2008, the Kaplan Institute has hosted nearly 30 innovative and award-winning artists working in diverse media. The Institute situates the artist within a scholarly interdisciplinary community where they share their practice with the broader Northwestern community through screenings, exhibitions, lectures, concerts, readings, or performances. A department or program at Northwestern must nominate and cosponsor an artist for residency. The program provides a stipend, production budget, and housing, and artists are expected to have substantial interaction with students over the course of the residency, through teaching appointments, short-term seminars, and open studios, and public events. In the past, the Kaplan Institute has collaborated with the departments of Art Theory and Practice, Art History, History, Latina/o Studies, Radio/Television/Film, Asian American Studies, the Segal Institute, Global Humanities Initiative, Global Languages Initiative, Residential Colleges, the Block Museum of Art, and the Northwestern Libraries.